Mirror mirror on the wall, who's the doll-est of them all? Could it be YOU? Have you ever played with dolls as a kid, or maybe as an adult too? When you wake up in The Puppet Master, it turns out that it's time for a bit of role reversal! Your reflection in the mirror confirms your suspicion that your soul has been trapped in doll form, and you are soon accompanied by a voice of a woman. Simply solve a few puzzles and try not to cringe too badly at inaptly timed puns, and you will have your body returned to you. Fair enough, right? The game introduces concepts cleanly, one-by-one. You play from a top-down style, but this new dollhouse world of yours is anything but flat. Bottomless, impassable pits (you lack a jump ability) are one of the less notorious but most common obstacles. Personally, I'll admit I was a little lulled into complacency by the opening stages and the charming simplicity of the mechanics. When I finally finished the game a couple of breaks, some hours, and a few words I can't type in a JiG review later, I obtained a more enlightened perspective. As you delve deeper in you will encounter more dangerous obstacles and more violent deaths. At several points, it is possible to become stuck in a level and be forced into restarting due to one-way conveyor belts. You will also need to avoid moving, saw-like blades that will cut you to shreds if they get the chance. The main mechanic (and thus, your ally) is the magical ability to shift your puppet sentience from body to body. As you transfer yourself, you leave nothing but an empty husk in the previous doll, waiting motionless for you to return to it. 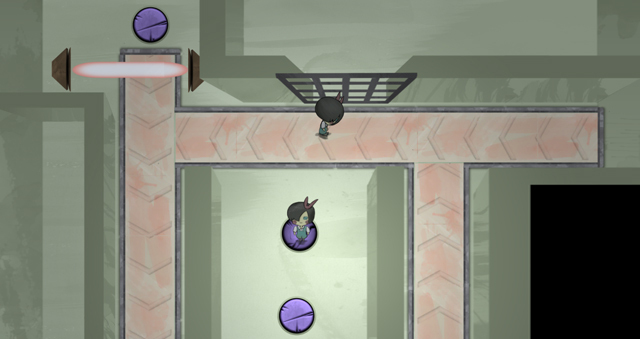 Many levels require a specific, well-timed executions of switches in order to unlock and reach the door to the next level. Walls and barriers also get in the way, barring you from moving your soul through them. The one main rule is to not let a doll perish to some obstacle while your soul is within it...but no one says you can't let the empty ones die as soon as you have swapped yourself out. Leave them die, if you dare, like the true monster you are! Controls are introduced as you step into the levels of the game, but I'll provide a quick run-down. Arrow keys or [WASD] are used for navigation, [X] to attempt to swap your soul between doll bodies, and [Z] as a general confirm/proceed button to advance dialog, open doors, etc. You will also need to use arrow keys to cycle between dolls you want to switch into, which can become a bit hairy when there are multiple and swaps must be executed quickly and precisely. By holding [C], you may pan the camera to get a better view for parts of the game off the screen, which is useful for the larger levels. Restarting the levels can be done with [R] if you become stuck. Finally, [Esc] brings up the options menu. The game can also be played with a joystick, and those controls can be accessed through options. Despite solid gameplay, there are a couple of areas in where I have minor gripes with the game. Many of the levels have a strict premium on linearity. There is only one real "solution" and that must be followed. As there are an infinite number of possibilities with movement of the individual dolls, this stifles creativity. It seems the usual constraints (time, money, ...) may have been a factor in this regard. The second, more substantial issue I have relates to the ending. I don't want to spoil it so I'll be intentionally vague, but if you really want it to remain a surprise, you may want to skip the next paragraph and scroll down to the links. Essentially, at the end one is given a prompt and your answer determines which one of two endings you fork out into. However, guessing or knowing the correct prompt still isn't enough. One must locate hints corresponding to it that are scattered throughout the levels, some in more visible places than others. If you miss one or more (as did I) that means, you guessed it, you'll have to start another playthrough all the way from the beginning should you wish to observe the alternative ending. While I can certainly understand where the developers are coming from with this sort of anti-cheat gimmick programmed in, it was frustrating to have to play a second and third time to track down all the notes and unlock the last scene. In my opinion, this should have been mitigated by (i) allowing the player to guess or (ii) unlocking level select at the end of the first playthrough, so one could replay individual levels and check for notes without necessarily having to navigate every last puzzle again. All in all though, it is quite an enjoyable and refreshing puzzle game with a rather unique twist, along with the perfect blend of softly haunting music. So, be a doll and find out who really controls the strings in the end - you, or The Puppet Master?